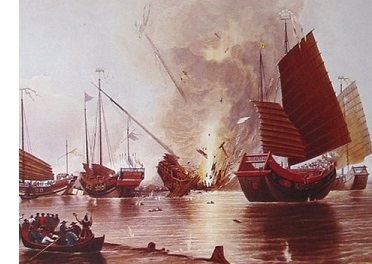 First Opium War (1839-1842) - After European nations opened sea routes to Asia, they tried to open trade as well. Great Britain established an embassy in China at the end of the 18th century and wanted access to such goods as silk and tea. But China was reluctant. A compromise was reached in which a single southern port, Canton (modern Guangzhou), was opened to foreign trade. It became known as the Canton System. The British East India Company grew opium in India and had a virtual monopoly on the plant. In the early 19th century, it began trading opium in China through Canton. Naturally a lot of people along the southern coast became addicted to it which alarmed the Qing Dynasty ruling China. The Daoguang Emperor banned opium and took measures to enforce the ban. These included confiscating shipments (without compensation), preventing British ships from docking in their port and seizing opium that got through on the black market. Although the British government did not object to China's right to ban opium, it objected to the seizure of its goods without remuneration. China refused to change its policy and the disagreement led to war. The opium trade was not the sole purpose of the conflict, but it was large enough that the war takes it name from the drug. It is also sometimes referred to as the Anglo-Chinese War. At the time, Great Britain was the world's top superpower with the strongest navy on the planet, while China was falling behind the West. Britain seized the island of Hong Kong and established it as a base from which to wage war. Fighting broke out in November 1839 when the British Navy sent ships to protect British merchant vessels. They opened fire and sank several Chinese ships. Although the war lasted nearly three years, it was a very one-sided affair. England did not need to conquer the entire nation, it simply needed to keep trade flowing through the southern port of Canton; and China could do little to fend off the Royal Navy. It concluded with the Treaty of Nanking in 1842 and ended with China up opening five ports to British trade as well as ceding the island of Hong Kong to Great Britain. But it failed to resolve all issues between the two nations and led to a second war the following decade. It's also considered the first of a series of "unequal treaties" by the Chinese which they viewed as humiliating terms imposed by the West which they sought to overturn in later times.